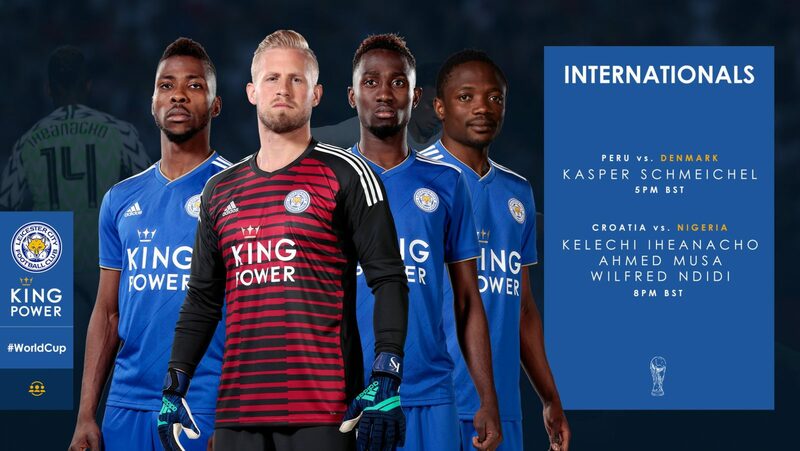 Premier League club Leicester City have backed four of their players, Super Eagles trio Ahmed Musa, Kelechi Iheanacho, Wilfred Ndidi and Danish goalkeeper Kasper Schmeichel ahead of their group openers. The News Agency of Nigeria (NAN) reports that the Super Eagles will take on Croatia in their first group game in Group D on Saturday, which will be preceded by the game between Argentina and Iceland. Ndidi, Musa and Iheanacho are expected to be in action for the Super Eagles against the star-studded Croatians. Also on Saturday, Denmark and Peru, who are making a return to the World Cup for the first time since 1982, will clash in Group C.
Schmeichel should be in goal for the Danes who are making a return to the World Cup after missing out at the 2014 edition in Brazil. “Four Foxes get their #WorldCup campaigns underway this evening. Good luck, lads!” the 2015/2016 Premier League champions wrote on their verified Twitter handle. The 2018 FIFA World Cup which kicked off on June 14 is expected to end on July 15, this year, in Russia.